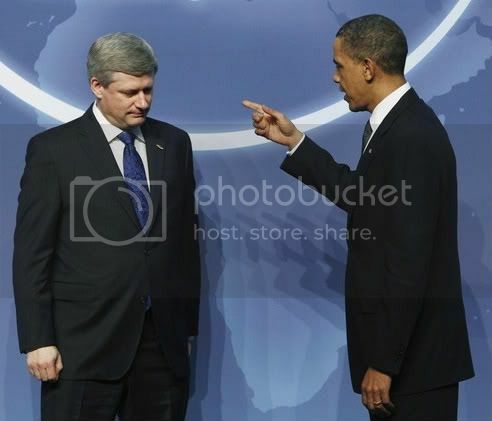 Obama: Bad Harper! You don't make that here! Do I have to wipe your nose in it? (From left to right: Angela Merkel, Vladimir Putin, David Cameron, Barack Obama and François Hollande. In the foreground, from right to left: Enrico Letta (Italian PM), Herman Van Rompuy (EU President)). Obama (thinking): Man, what nice muscles Putin has. 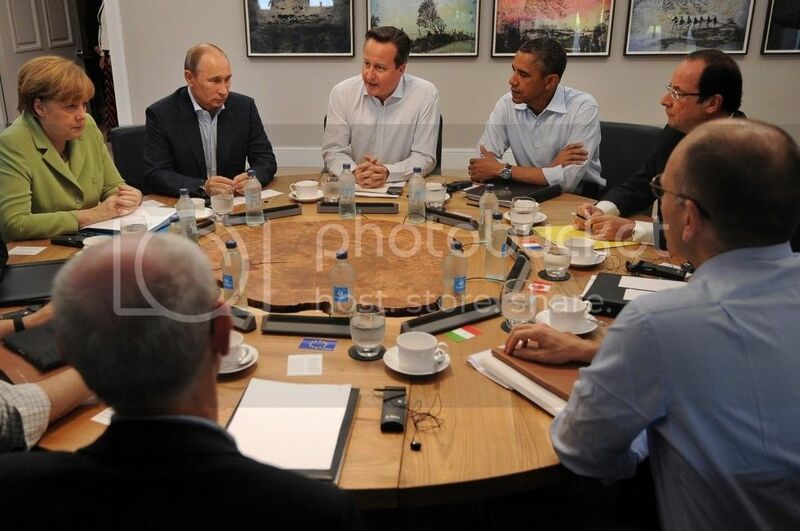 Putin (thinking): I hate these meetings. Obama and Putin (thinking): Did I leave the stove on? Cameron: So we all agree to order the chicken? Obama: I want ice cream. Cameron: No ice cream for you! cameron: i called you all here to tell you that putin and i are getting married. Cameron: It is agreed then, unless Putin gives back Crimea, he will have to face our ultimate weapon, the tickle monster. David Cameron: That's just GREAT! We all have our bottle of water, a full glass, and an empty coffee cup and gather here to play poker, and Barak forgets to bring the CARDS and CHIPS! Obama: I did bring the dip; it's over there. David Cameron: Not THOSE kind of "chips" you moron! I think it's time to pick our winner... before this Thread sinks into oblivion?!!! I sure hope it's me this time!!! (06-01-2014, 03:06 PM)DrThimmel Wrote: I think it's time to pick our winner... before this Thread sinks into oblivion?!!! Haven't forgotten about this, I'll try to change this in the next week. Good job "Agent G", am I the winner of this one? I think your image is broken. (02-08-2016, 11:37 AM)aquasith3478 Wrote: I think your image is broken. I know, ImageShack went paid a couple of months ago and got rid of all my free images. I'm replacing the image with one I've hosted on Photobucket.